You can easily make your own with ingredients you most likely already have in your kitchen pantry. Not only do you save money, you know the quality of what you are getting…. I have been wanting to make my own ketchup for a while… After an incredibly busy day, I sought the calmness of my kitchen to settle my thoughts… Here’s what resulted… I love it and hope that you do too…. Pour into containers and refrigerate. Being a busy Mom, dinner time can sometimes be a challenge. During the week, I try to keep meals simple and “quick to make” without sacrificing quality and flavor…. This recipe is not only fast and easy….it is full of flavor and healthy. My family really enjoyed this and the leftovers were appreciated. Cook pasta acording to directions on box and set aside. Heat oil in a sautee pan and cook the onion and pepper for 3-4 minutes until softened. Add garlic and cook an additional 2 minutes. Add the ground turkey to the pan. Season with 1-1/2 tablespoons of the Sumac House Spice Blend and also with salt & pepper (to taste). Cook turkey until all juices run clear (all the pink is gone). Add the jar of marinara and 1/4 cup of water. Bring to a boil. Add remaining 1/2 tablespoon of the Sumac House Spice Blend. Simmer for 10 minutes. Adjust the seasoning as needed. 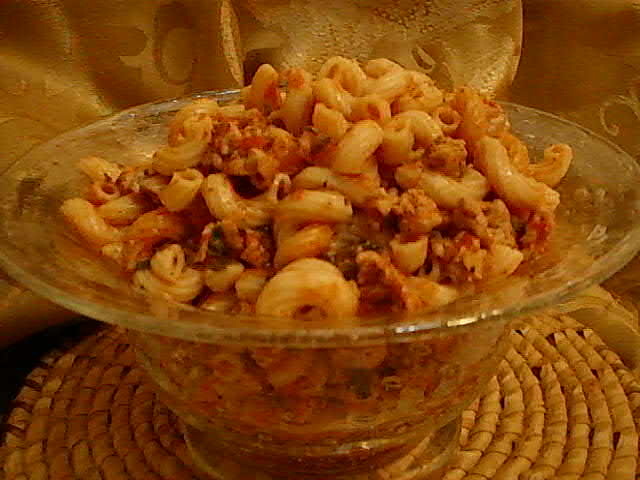 Stir the meat sauce into the pasta along with the parsley. Serve with crumbled feta on the side. Sumac Pepper is a traditional spice blend that many keep in their kitchens not only for cooking but also as a condiment at the dinner table. In a small bowl, mix both black pepper and sumac. Store in a container and / or pepper shaker.. 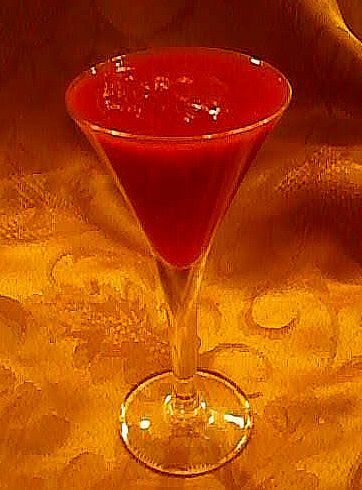 Welcome to the debut article on the Gyspy World Spice Cafe blog. Why choose Sumac for the debut article? First and foremost, be very careful when buying the spice Sumac. Always buy the spice Sumac from a reputable source. You do not want to have it confused with an the ornamental Sumac shrub grown in America that has inedible poisonous white berries (aka Poison Oak). I was very surprised to read about the spice Sumac’s medicinal uses and health benefits. It is known to have the affect to calm your stomach, promote digestion and reduce fever. I also read that some believe it to contain antioxidants and possess antimicrobial properties. Empowered with all this information, I continued my search for the spice Sumac. While out and about with the family, we found that a new Mid-Eastern store had recently opened at a local shopping center. We all went inside to check it out and asked about Sumac — THEY HAD IT! After leaving the store, I carried my my purchase like I scored a treasure. Before we even got to the car, I had already opened the container to smell and taste the Sumac. It was pleasant and slightly tart. It was definitely not overpowering or dominant in either flavor or taste. The next day, I hit the cookbooks and brainstormed ways to thread this new spice into my family meals over the next few weeks. 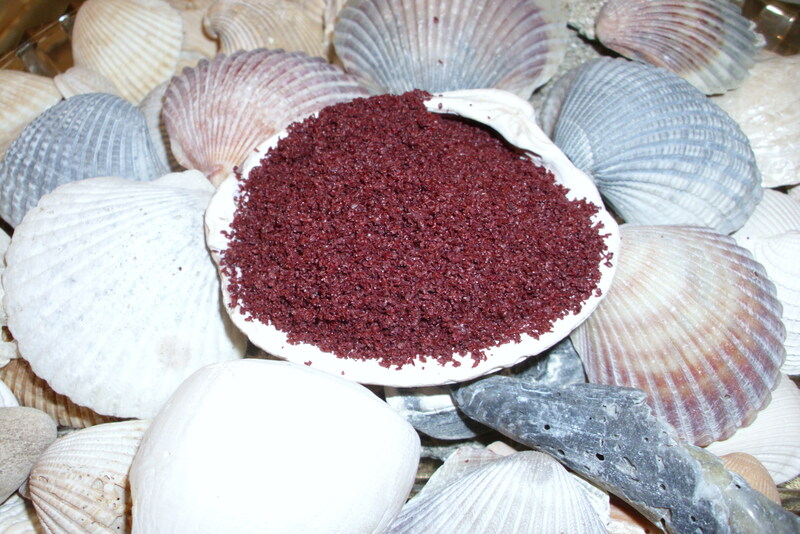 I’ve incorporated the spice Sumac in breakfast, lunch, dinner, appetizer and even dessert dishes. I tried it on eggs, added it to both Pizza Sauce and Marinara Sauce, used it in hummus (adding a dusting on the top too), and on vegetables. It is very flexible and I think the best way to describe the spice Sumac is that is in my opinion it is a “flavor enhancer”. It takes food to the next level without you realizing it. It is a background flavor that leaves you wondering hmmmm this is good and I’m not sure why… At this point, I cannot imagine my spice cabinet without the spice Sumac. This traditional spice blend is used on vegetables and flatbread. You can mix it with olive oil or yogurt to make a very good dip. Mix all ingredients in a small container with a lid. Give it a good shake. Place the chickpeas in a large bowl, cover with water and leave to soak overnight. Drain and place in a large saucepan. Cover with water and bring to a boil, then simmer for 1 3/4 hours, or until tender. Drain. Heat the oil in a frying pan, add the onion and cook over low heat for 3-4 minutes, or until soft and just starting to turn brown. Cut the tomatoes in half, remove the seeds and dice the flesh. Add to the pan with the sugar, cinnamon and garlic, and cook for 2-3 minutes, or until softened. Wash the swiss chard and dry with paper towel. Add to the tomato mix with the chickpeas; cook for 3-4 minutes, or until the swiss chard wilts. Add the mint, lemon juice and sumac; season and cook for 1 minute. Serve at once. Taster Comments: One taster commented “This stuff is great!”. Another taster commented “Love It!” and ate two servings. Place the chocolate chips into a medium sized bowl. Microwave for 30 seconds at a time until the chips have softened up. Stir until smooth.Stir in cinnamon and 1 teaspoon of sumac. Pour the melted chocolate mixture onto the wax paper. 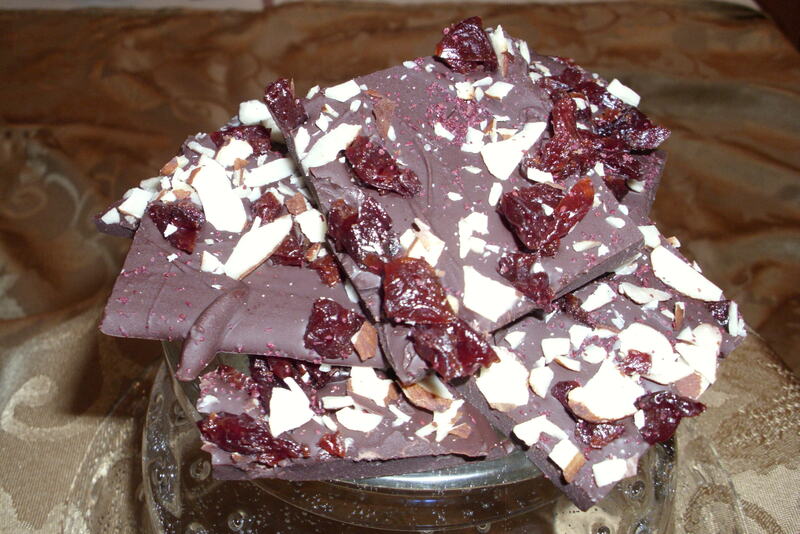 Using a spatula, evenly spread the chocolateSprinkle the cherries and almonds on top. Using an off-set spatula, gently press into the chocolate. Dust the chocolate with the remaing 1/2 teaspoon of sumac. Chill until set. Break into smaller pieces and store in an air-tight container in the refrigerator.